Shisaku: Are The Voters Set To Surprise The Cynics? Polls on intentions tend to overshoot actual voting by about 10%. 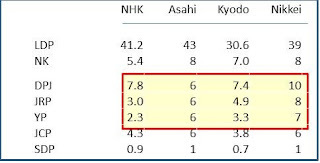 For example, the NHK poll figure in the week before the 2010 election was 71%. The actual turnout rate was just under 58%. With a 13 point drop off, the voter turnout this year will be around 53% -- a much better figure than the one I have projected. Higher rates of voting are usually seen as favoring non-machine parties over the voting machines of the LDP, the Communists and the New Komeito -- though given its current broad base of support, it is probably not accurate to refer to the LDP as a machine party. Just which non-machine parties are set to benefit from increased voter participation is a BIG question. The support numbers or likely-to-vote-for numbers for the Democratic Party of Japan, the Japan Restoration Party and the Your Party are all over the map. To be fair, the figures for the LDP and the Communists are all over the map too. So what happens in the case where, let us say 53% of the electorate shows up and votes in the proportional race slanting in the way the crazy Asahi Shimbun figures indicate, with me doling out the undecideds proportionately (with a little boost to the SDP for old times' sake)? While this result along with projected district wins gives the ruling coalition a safe majority in the House of Councillors, it still leaves the forces of constitutional revision out of luck -- unless, of course, there are sleeping constitutional revisionists in the ranks of the DPJ members of the House of Councillors just aching to join forces with the LDP, the JRP and the Your Party. The above distribution would, however, put the LDP over the 72 seats its needs to say hasta la vista to its coalition partner the New Komeito -- assuming that the LDP wins every district seat it is contesting, of course. 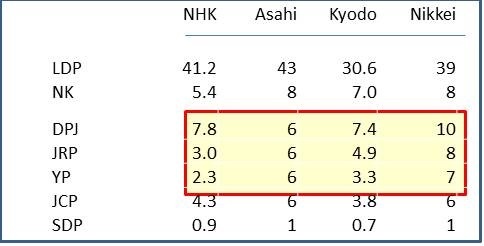 Getting back to the issue of turnout, there is another reasons to doubt it will be even close to what the NHK intentions figures indicate, in addition to history showing the predictions to be inflated. The 65% response rate to the July 13-15 telephone survey is way up from the normal 50%-55% response rate. Intuition tells us that a large number of respondents in the intentions survey were role playing, demonstrating interest in the political process because they feel they should be doing so. While demonstrating the proper respect toward democracy is laudable in a society where a faux contented conformance with the current operative reality is rewarded more strongly than it is in other societies, responding because you feel you should will skew results toward recent changes in momentum and atmospherics rather than reveal significant changes in voting decisions. I do not buy the argument that a LDP goal is to get a majority by itself in the Upper house so it can dump NKP. If that were the goal it is going about it in an expensive way. It seems the way to 72 seats would mean LDP has to win 48-49 district seats and 23-24 PR seats. 23-24 PR seats would mean it has to win almost 50% of the PR vote. But if it could pull that off, then LDP should just nominate 2 candidates instead of 1 in the 10 2-seat districts and one more in Aichi and Kanagawa districts. If LDP is as popular as to come even close to winning 50% of the PR vote then for sure a bunch of these 12 extra LDP candidates could win without risk of having the existing LDP candidates losing due to LDP splitting among multiple LDP candidates. That the LDP is conservative in its nomination strategy means that it does not necessary believe these polls that have the LDP way ahead. Besides, even if LDP pulls off 72 seats it would be foolish for it to dump NKP. Once the Abe magic wears off, and DPJ recovers, a DPJ-NKP alliance would be deadly for the long-term electoral future of LDP, even with an alliance with YP and/or JRP.